Visiting the Historic Garden in Annapolis Royal (Nova Scotia) was one of the best experiences of the trip, for me. For Tim, not so much. He took a nap in the car, hit by the cold that plagued our trip. Strong winds sighed in the trees at the gardens, blowing warm and humid. The locals said it was quite unusual. The scent of lilac drifted everywhere. A variety of gardens delighted and informed. The roses were not yet in bloom, but the peonies made up for that. This wire sculpture, named Fern Dancer, added a whimsical touch. I loved this garden and would enjoy returning for more exploration of it, and of the town of Annapolis Royal. And if I do, I'd love to stay in this Bed and Breakfast - the Queen Anne Inn. Doesn't it look charming? Next time. This first week back home included a visit to another garden - our local Butchart Gardens, with the trio above. Sweet peas and roses, begonias and geraniums - there was much to delight. The Little Miss and I rode on the carousel together while my DIL manned the camera. Round and round we went, up and down, down and up. I was very surprised when, passing by the blue poppies, my DIL said she knew the Latin name. She used to work at the gardens. I asked her if she knew the Latin for all the flowers there, but she said that this blue poppy is the only one all employees need to know. 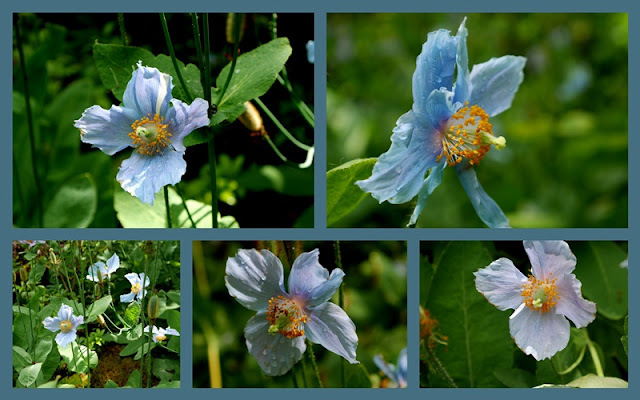 The Himalayan Blue Poppy (Meconopsis) was brought to the gardens by Jenny Butchart in the 1920s and is quite special to the gardens. Two gardens a continent apart. Unique. Beautiful. Beautiful gardens, glorious blooms, a stunning B&B and a family day out, what a perfect post! What a wonderful trip especially spending time with small smiling faces and seeing blue poppies. Wow. I would love to have a blue poppy, but I don't think that I have ever seen them in the nurseries. You had a wonderful trip, but I be that it was nice to get home and get life back to normal. I enjoyed your post cards along with your narratives. Let's see, it went something like this: The poppies are so beautiful! I think that the trio, among others, is a very good reason to be on the West Coast again. So glad that you had a good trip East (especially, leaving out the colds). I was just thinking about bygone days and blogging friends this morning and popped around to see how you were. So happy to see you're still blogging. What beautiful photos of flowers and family. Truly a lovely post. Also LOVED seeing the photos from your trip to PEI and the home of Anne! It's a dream of mine to get there someday, too. :) It looks like things are well with you, and I am thankful to see that. May God continue to bless you and your family. Hi Lorrie, your trip to Nova Scotia looked so wonderful. Every photo was beautiful and the Bed and Breakfast looked so charming. I'm sure it is just as lovely on the inside. It's always great to be back home, I'm delighted that you had a chance to get away and have this adventure and thanks for sharing it with us. It might be a part of the world that I will never see, so tagging along with you was a treat. Beautiful images of the Historic Gardens. I have been to Butchart Gardens but not for a long long time. Very beautiful too. Hello Lorrie, what a wonderful trip. I am sure you enjoyed visiting with your daughter and grandchildren too. It looks like a beautiful place. I love the sculpture and the pretty poppies. Happy Monday, have a great new week ahead! Looks like a lovely garden Lorrie and what a beautiful B&B. So sorry to hear your husband was not feeling well. Hope he is up and running again now. That's the ride for me--the merry go round. 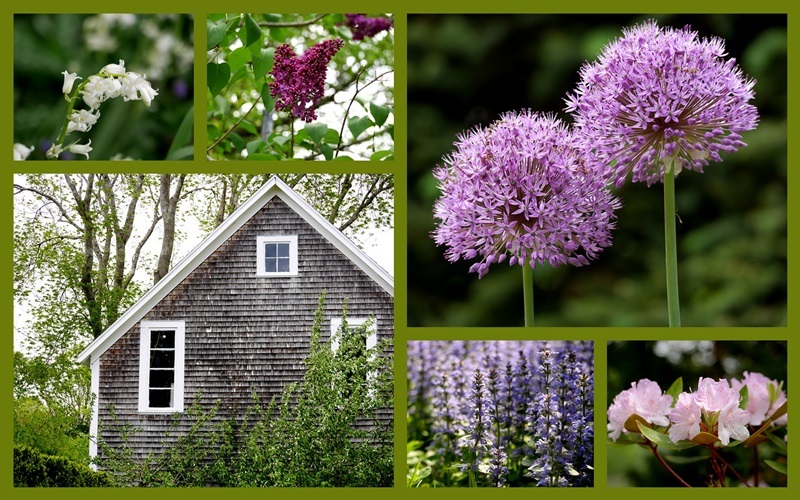 The two gardens both have such beauty…and your pictures show that well. I'm sure you were glad to see your grands again! And the B and B looks very inviting! Both beautiful gardens. Those blue poppies are really great. I wouldn't mind staying in a B & B that looks that lovely! I love visiting beautiful gardens too. We visited the beautiful Butchart Gardens in 2008 and they were spectacular. How lucky to be close enough to visit often! O,what a lovely garden..no wonder you fell in love. We visited Butchart Gardens on our Alaskan cruise 5 yrs ago and it was breathtaking. I could easily stay at the Queen Anne Inn, it looks very homey. There are beautiful gardens in the east but I think Butchart would be my pick for the best. Nice to be back with the family - hope the colds are gone now. So much beauty in this post! Your daughter and grandchildren look so happy, the Fren Dancer sculpture so whimiscal, the blue poppies are exquisite, the B&B looks so stately, and the merry go rounds looks like so much fun! I hope your husband feekls better by now! What a lovely post, Lorrie! Happy people - big and small - and beautiful flowers. The colours of these flowers are wonderful... and the Bed and Breakfast looks enchanting. Sounds like a wonderful time...there are so many pretty things in your post, but my heart is always captured by the blue poppy....I used to get in trouble for warning the customers not to let it bloom the first year or it wouldn't return, lol. My boss liked the repeat purchases.. So nice to see the two gardens, thousands of miles apart. They are both beautiful. I've never seen blue poppies before. I love your mosaics. Have a great week Lorrie. So wonderful to have the beautiful Butchart Gardens in your backyard and I love that you are introducing your grands to the beauty! Everyone looks so happy! But that other garden way over on the other side ..l how glad I am that you were able to share it as well . The Fern Dancer is a lovely piece of outdoor art! Beautiful gardens and looks like a fun day! What wonderful gardens and photos. And such lovely photos. Fern dancer is wonderful. We bought seeds for that blue poppy the last time we visited this garden. They didn't produce, sadly! They are beautiful! That is pretty special to see two beautiful gardens a continent apart within such a short time!